Batman is anything but the Dark Knight in a new remake of his classic ZX Spectrum game. After almost 4 years, a team of Batman fans has completed a modern remake of the caped crusader's first commercial videogame that was released by Ocean Software on various platforms such as the ZX Spectrum and MSX computers back in 1986. The aptly titled Batman had very advanced graphics for its time, and somewhat frustrating gameplay, both of which are reflected in the remake. For some reason, Batman's early videogame years were spent collecting the pieces of his Batmobile so he could go and rescue a captured Robin. Why the Batmobile was disassembled, in nice, even pieces no less, and scattered about the Batcave, which has a way more labyrinthine feel than it does in the comics, is still a mystery to this day. I'm also not sure why Batman didn't just take another car. Anyway, in Batman players must collect seven pieces of the Batmobile from the very dangerous Batcave to win. 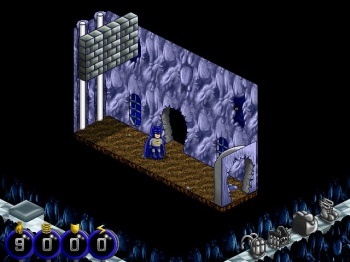 The game plays out in an isometric perspective, but instead of the basically two-toned graphics of the original title, the remake's graphics are fully colored and mini-Batman is as cute as a button. You won't find any thugs or villains like the Joker in Batman though, as the only enemies are strange Yeti, floating heads, and weird rotating machines. A simple touch from any of these will result in Batman's death, along with rubbing up against certain blocks or falling onto spikes. Batman was a fragile creature in the mid-1980s. Frustrations aside, it's not hard to see why Batman was lauded in its day. It has a Metroidvania feel, with players having to collect certain objects to perform abilities, such as collecting Bat Boots to jump. Other collectible items will speed Batman up for a limited time, or provide him with a shield. The remake lets you save your game at least once, which is very handy on a good run. If you'd like to get a taste of some classic, challenging gameplay in a modern and very cute shell, the remake can be found here.